Even though I am a big fan of eReaders, when you are on a plane and enjoying the hilarious book "King Dork" and then the flight attendants are all "switch off your device! "and you forgot to grab an US Weekly magazine from Hudson News and you realize the only thing you can do for 20 minutes is read SkyMall, you really wish the eReader was approved for take off. 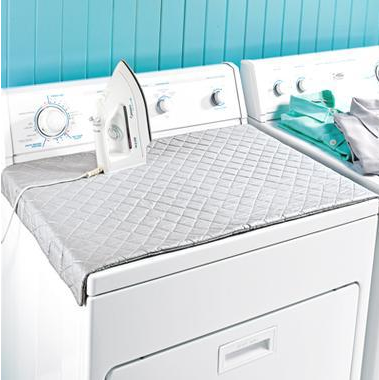 Lay this heavy, ironing board fabric down on top of your washer and tada! Instant ironing board. It has magnetized sides so the fabric stays in place and folds up really small and easy to store. If you are one of the lucky few to have a washer/dryer in your apartment (that isn't stacked), this solution makes total sense. Ironing boards are a big hassle to drag out and find space to open & use, so this invention is genius. Plus, it only costs $9.98 which is less than a glass of wine at most bars!